Players from around the world congregated in Auckland this week for the Badminton World Federation (BWF) Future Series event – the YONEX North Harbour International 2019. A large number of talented Chinese juniors were amongst the entry list, with several of the top junior players from various Chinese provinces getting their first taste for the open international badminton world. Only two seeded players/pairs made it through to the finals and the world number 64 from Vietnam was the only player to prevent a Chinese whitewash at the tournament. The men’s singles final was a masterclass between a badminton legend and a future star as the 2013 World Championships bronze medallist was up against the 2017 World Junior Championships bronze medallist. The first seed and world number 64 demonstrated his wealth of experience and oozed confidence on the court as he took the first game. Zhengze showed more composure after swapping ends and was in closer contention as the match progressed. However, the nineteen-year-old player wasn’t able to get past the thirty-six-year-old Vietnamese star and Nguyen continued his run of straight-set wins to take the title. Along her way to the finals, Qiu Ziying celebrated one of the biggest wins of her career after overcoming the first seed from Vietnam, and the world number 61, Thi Trang (B) Vu. The eighteen-year-old from China is currently ranked 855 in the world but has proved her ability to reach far higher this week. In the final, Australian opponent Qin Jinjing had to retire through injury following an equally as impressive run up until the finals. China’s young pairing of Xuheng Zhuanyi and Zhang Binrong, currently ranked at 653 in the world, displayed an unforgiving attack throughout the week as they powered past the second seeds in the second round. They brought the same confidence to the court in the finals as they overcame their first seed opponents from Australia, Simon Wing Hang Leung and Mitchell Wheller. An all-Chinese affair, the up and coming junior pairs competed in their first ever international final. Pan and Yang showed that they have every ability to compete with the more experience players on their route to the final, after overcoming the first seeds in the semi-finals. The pair got off to a slow start against their fellow teammates in the final, but built momentum and powered through the second to take the title. 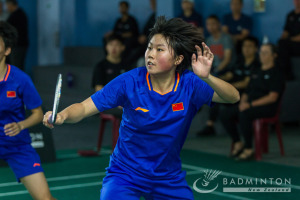 Chinese superstar Pan Hanxiao demonstrated her excellent doubles skills across the board as she was the only player to walk away with two titles from this event – women’s and mixed doubles. Alongside her partner, Zhang Hanyu, the teenagers defeated the first seeds and reigning regional Champions from Australia, Simon Leung and Gronya Somerville on their route to the final. In the final Hanxiao went one better than her women’s doubles partner and took the mixed doubles title over three competitive games. All results from the tournament are available to view on Tournament Software.